What to Do About an AC Water Leak? Hmmmmm, there is ice on the coil in my indoor AC unit. That’s odd, I guess. But hey, it’s a cooling system—looks like it just got a bit carried away with itself this time around. No big deal, right? Wrong! Sure, your air conditioner is a cooling system, but that doesn’t mean that it’s supposed to be functioning as a freezer! If you notice ice on your system, then something is definitely wrong. It is just a matter of what has gone wrong. Like most air conditioning problems, there are a few potential causes of this issue. Some are very serious, while some are actually quite simple to resolve and won’t even require professional intervention. One thing is certain, though. It is always going to be best to resolve such issues promptly, particularly if you require professional air conditioning repair in Plainfield, IL. Read on, consider your situation, and contact us if you have any concerns. What Does This Coil Do? Before we talk about why this coil may ice up, we should cover what this coil does so that you can understand how ice may form to begin with. 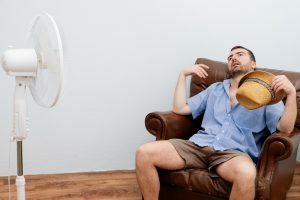 For starters, let’s remember that your air conditioner does not generate new “coolness,” but instead removes heat from the air that is already in your home. It does this by evaporating refrigerant in the evaporator coil. If that coil should get too cold, then the condensation on the coil may freeze up on it. There is condensation on this coil because the air conditioner has a dehumidifying effect on the air as it cools it, causing moisture to condense on the coil. Well, because the coil gets too cold! Why? There are a few potential reasons. The first is just a very dirty air filter. Remember we said that you may be able to resolve the problem yourself? This is precisely what we were talking about. When the filter in your air conditioner is too dirty, it will restrict airflow through the system. In doing so, it will make it harder for the coil to remove a sufficient amount of heat from the air in your home. When that happens, the coil gets too cold and condensation can freeze on it. It could be the result of a much more serious problem, though. The way that the coil really facilitates the cooling process is through the evaporation of refrigerant, which means that too little refrigerant could also result in the coil getting too cold. If there is not enough refrigerant in your system, and you continue to run it, then there is a possibility of doing truly extensive damage to your air conditioner. In fact, you could ruin the compressor entirely, which would require the replacement of the total system in most cases. Be sure to let us know if your system is icing up and the filter does not seem to be to blame. You don’t want to let this problem continue to get worse.